On the 14th of September 2012, Facebook welcomed its 1 billionth member and was declared the third largest country in the world (The Independent). Despite the numerous discussions around the relevance of the medium itself and the critique carried by a number of theorists, the overwhelming number of people who use the social platform around the world recommends it as an entry point into information previously unavailable. Facebook users not only share pictures and thoughts with the help of the platform, they also organize in groups according to their interests. Such Facebook groups offer the ideal context of sharing information within a closed circle (the platform offers the possibility of closed groups, where access is granted only by an administrator and the information posted in the respective group is unavailable to non-members), among people that have similar interests. An alternative to Facebook groups, the Facebook fan pages, allow users to follow a certain Facebook page that offers them information based on their interests. By clicking the like button on a Facebook fan page the user agrees to receive the information posted on that page as updates on its own timeline. Given the global attributes of Facebook (users can connect indifferent to their location throughout the world) and the possibilities to interact and connect through groups and fan pages, with the option of privacy (as in the case of closed groups), various organizations started using Facebook as one of their main channels of communication. While Facebook fan pages may be considered a tool for propaganda and, thus, gathering new members in a certain organization (through spreading information that attracts non-members into becoming members), Facebook groups often help users organize for action, such as protests, as it has happened during the Arab Spring or the civil war in Syria. Extremist groups, that form the counter-jihadist movement, represent no exception when it comes to using Facebook as a tool for communication, sharing information and organization and co-operation between different factions. We have started from the assumption that counter-jihadist groups in Europe have a strong presence on Facebook, thus our study attempts to create profiles of those organizations on Facebook as well as map the connections within and between groups. The main goal is to find out whether we can talk about a European network of anti-Islamic organizations on Facebook or are they rather closed groups that operate mainly within the borders of their own countries. Secondary, we set out to gather as much information possible from those Facebook groups, such as administrators (and their profile) and number of members. Which of the 'counter-jidahist' organizations and leaders are present on Facebook and what form of presence on Facebook did they choose? To what extent are the members of the 'counter-jihadist' organisations connected within their Facebook groups? How are the 'counter-jihadists' organizations connected between each other? Who are the formal leaders of counter-jihadists organisations when looking at their facebook groups? The first step in researching the presence of extremist organizations on Facebook is to join counter-jihadist groups (especially ones that are closed to the general public) and also like the fan pages dedicated to such organizations. Due to potential liabilities represented by the use of personal Facebook accounts, we have built a Facebook profile solely for the purpose of research. Our initial approach was editorial, using already available lists of known counter-jihadist organizations in Europe. The list that we have based our research on is provided by the Counter-Jihadist Report created by the Hope Not Hate organization. This list includes the most influential European 'counter-jihadist' organizations and twelve most important leaders. Starting from this list, our research attempts first to expand it (by uncovering counter-jihadist organizations present on Facebook, not included in the Hope Not Hate official list) and to create a map of these 'counter-jihadist' organizations present on Facebook. In order to gather data from Facebook, groups (whether open or closed) were joined by requesting access from the group admin and Fan pages were liked. We have requested access to all 44 groups and have been accepted in 18 of them: Den Danske Forening (Denmark), Stop the Islamisation of Denmark (SIOD), Perussuomalaiset (Finland), Bloc Identitaire (France), Ligue de Defense Francaise, Movimento Sociale  Fiamma Tricolore (Italy), Forza Nuova (Italy), Mario Borghezio (Italy), Fremskrittspartiet (Norway), Norwegian Defense League, Espana 2000 (Spain), Plataforma Per Catalunya (Spain), Swedish Defense League, Swiss Defense League, British National Party, Stop Islamisation of Europe (England). Joining each group requires access being granted by the groups administrator, which, in some cases, may take a longer period of time. Thus, the number of Facebook groups we have been accepted in has been limited due to time constraints. Further research could benefit from the inclusion in a larger number of groups. Using the names of European counter-jihadist organizations and top leaders provided in the Hope not Hate report, we have manually checked their presence on Facebook. Being accepted in Facebook groups is mandatory in order to access information regarding administrators. Some of the organizations enumerated in the list have numerous local branches, but we have chosen the ones located in capital cities (that also have the biggest number of fans and members). After building our own list of the organizations and fan pages present on Facebook and their description (number of members and/or likes, whether they have branches or not), we have created an interactive map of Europe, with a country profile for each of the states in which we could find counter-jihadist organizations. This map is visualized in Prezi and offers a comprehensive view of the presence of extremism in Europe and its extent. The administrators of the groups we have been accepted in have also been checked manually, first against the list provided by Hope Not Hate (to see if there is any overlap between real organization leaders and Facebook group administrators). Secondly, group administrators have been looked up on Google, to gather elementary information on their activity. The purpose is to find out if these administrators are also prominent figures in real life (businessmen, party leaders and so on). This would also give us means to connect different organizations through their members. The data about friends connections within the 18 groups on Facebook was run through the Netvizz application. Then, all the 18 files were opened in Gephi in one graph. 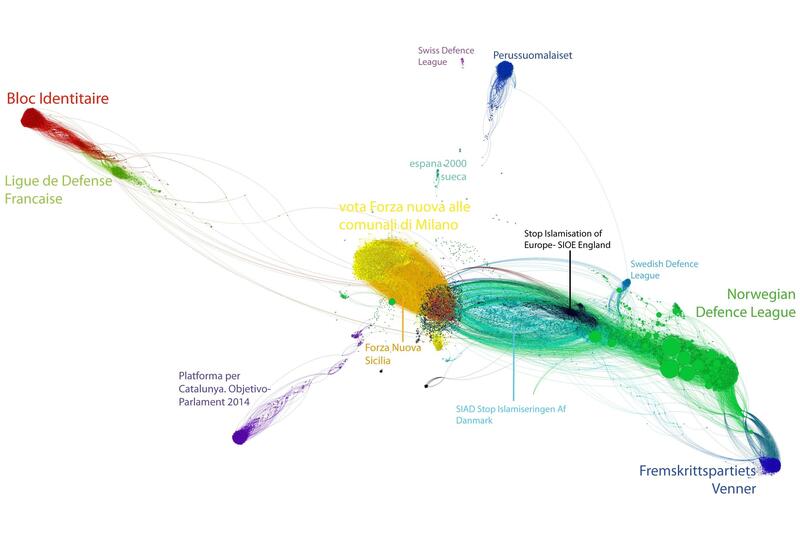 The program visualized the friendship connection within groups and between groups, thus picturing the network of counter-jihadist organizations in Europe. The program also allowed to identify language of Facebook interfaces of the group members. It could be assumed that if the group members use a local language, they are of the given nationality themselves. The Gephi Graph also made it possible to identify key members of the group,s i.e. those with the biggest numbers of friendship connection and those that connect different Facebook groups. We have identified the users and listed them in the Excel sheet. The comparison between leaders of actual groups and key users on Facebook can be useful for the researchers monitoring extremist groups and their most active members. Using the triangulation tool we have identified the number of users belonging to two or more Facebook groups, thus serving as links between those groups. There are 131 counter-jihadist organizations and leaders from 16 countries in our analysis. Out of the total number, 47 are not active on Facebook. This means that these organizations and leaders do not communicate on Facebook through groups or Fan Pages or their members did not build Facebook Pages or Groups. 37 of the researched organizations and leaders communicate exclusively through Facebook Fan Pages and 12 communicate exclusively through Facebook groups. 35 use both Facebook Fan Pages and Facebook Groups. As said before, many of the researched organizations have numerous branches. Some of the bigger Facebook groups may have up to 100 different other pages and groups connected to the main one, as it happens in the case of the Lega Nord in Italy. They are used for regional branches of the organizations. Further research would benefit from a deeper look into this Facebook groups and their administrators. The members within most 'counter-jihadists' Facebook groups are tightly connected to each other by Facebook friendship connection. Some groups constituted of members not connected to each other by friendship connections (British National Party and a part of the Swiss Defence League), but most groups are formed by a network of friends. Looking at the language of interfaces used by their participants it can be said that most of the analysed Facebook counter-jihadist groups appear to be local (or have members speaking a local language). However, several exceptions might indicate a more international nature of some of the groups. For instance, the group of French organisation Bloc Identitaire includes only about 36% of French participants and a significant amount of Russian and Ukrainian speakers (20% and 35%, respectively). Another case is the Swiss Defence League group with 46% French speakers, 8% German speakers and 36% English speakers. a) French groups Bloc Identitaire and Ligue de Defense Francaise. However, there are only 10 users who are members both groups. It shows that these two groups have unique members but have quite tight friendship connections on facebook. b) Italian vota Forza nuova alle comunali di Milano and Forza Nuova Sicilia. There is a significant number of members participating in both groups (107). c) Organisations in Scandinavian countries: Norwegian Defence League, Swedish Defence League (Stockholm division), Perussuomalaiset (Finland), SIAD Stop Islamiseringen Af Danmark, Fremskrittspartiet Venner (Norway). The only Scandinavian group that does not seem to have any connections with other groups is Den Danske Forening. However, it has 75 members who are also members of other Scandinavian groups. There is a significant amount of members that participate in more than one Scandinavian group: Norwegian Defence League (124) and SIAD (174). The connections that are not based on geographical proximity are usually formed by single individuals, usually administrators of the groups or leaders of the organizations. The Norwegian Defence League seems to be the most connected Facebook group, with friendship connections in Fremskrittspartiet Venner, SIAD Stop Islamiseringen Af Danmark, Swedish Defence League- Stockholm, Stop Islamisation Of Europe - SIOE England, and Swiss Defence League. Groups without any friendship connections with other groups constitute to the minority. Those are: PLATAFORMA PER CATALUNYA. OBJETIVO- PARLAMENT 2014, españa 2000 sueca, and Den Danske Forening. Group administrators often overlap with leaders or key figures in the organizations and political parties in real life. For example, groups from Belgium, Denmark, Bulgaria, Finland, France, Germany, Italy, Netherlands, Norway, Spain, Sweden, Switzerland are administered by members who are public figures, often well-known politicians who are official leaders or members of the parties or organizations they represent. On the other hand, 9% of European counter-jihadist groups on Facebook do not have a declared administrator. Two groups are administered by American nationals. Facebook groups from the UK do not disclose the real identity of their admins or their admins are not publicly known. Desislav Chukolov - admin of the Bulgarian ATAKA Facebook Group, member of the EU Parliament since 2007. Kenneth Kristensen Berth - admin at the Dansk Folkeparti Facebook Group, member of Danish People Party, nominated for EU Parliament. Anders Gravers - admin at the Stop the Islamisation of Denmark Facebook Group, also one of the admins of the SIOE Deutschland. Gravers is the actual leader of SIOE and SIAD. Pekka Pietu Sivonen - admin at the Vapauspuolue Facebook Group - is a True Finns and the Independence Party member. Fabrice Robert - admin at the Bloc Identitaire Facebook Groups - is the president of Bloc Identitaire. Also member of Ligue de Defense Francaise. The SIOE Deutschland Facebook Group is administered by Pavel Chernev (leader of Bulgarian Freedom Party); Michael Stürzenberger (political blogger); Stephen Gash (English Politician, member of SIOE) and Anders Gravers (SIOE Leader). Luca Romagnoli - admin at the Movimento Sociale - Fiamma Tricolore Facebook Group - is a member of the EU Parliament on behalf of Italy. Davide Caparini - admin at the Lega Nord Facebook Group - is a deputy in the Italian Parliament. Remi Steiner - admin at the Fremskrittspartiet Facebook Group - is a member of Party of Progress. Leo Baardsen - admin at the Norwegian Defence League Facebook Group, also known as Rune Hauge - is also the leader of NDL. Nasir Abdul - admin at the Swedish Defence League Facebook Group - is from Pakistan and has attended the University of Jihad. Christen Krogvig - admin of Stopp Islamiseringen av Norge (Stop Islamization of Norway), connects Norwegian Defence Group and SIAD Stop Islamiseringen Af Danmark. More than half of the researched counter-jihadist organizations use Facebook to communicate. Some of these organizations have numerous territorial branches, indicating the need to divide the online activity by the location of users. This proves that counter-jihadists use Facebook in their organizational activity and further research should look into more Facebook groups and also the content that is shared within these groups, in order to better understand the purpose of social media in this kind of activity. However, the impressive total number of discovered organizations and their subsidiaries on Facebook points to the fact that this is an important medium used by extremist groups and official lists such as the one provided by Hope Not Hate can be improved with the help of social media.